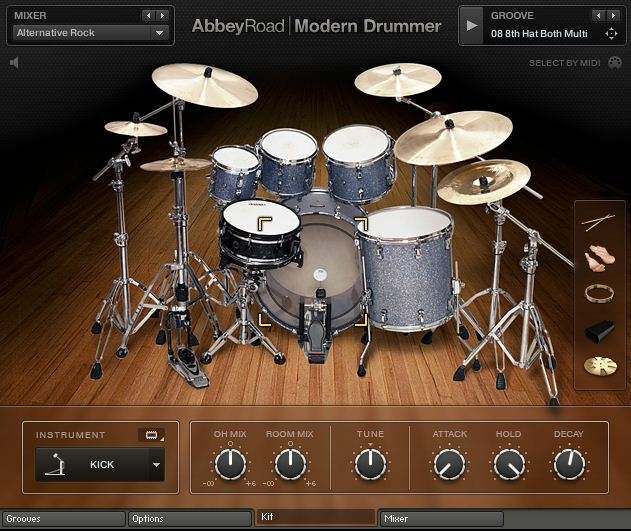 With the power of STUDIO DRUMMER, ABBEY ROAD | MODERN DRUMMER puts world-class contemporary drums at your fingertips. Two premium drum kits, recorded at the legendary Abbey Road Studios, deliver powerful, versatile drums for contemporary rock and pop – well-rounded, detailed, with a crisp, airy top-end and a perfectly-formed low-end with plenty of sub-bass. Command your own session drummer in the form of a well-stocked, versatile Groove Library, and fine-tune your submix with the detailed Mixer Section and class-A studio effects. 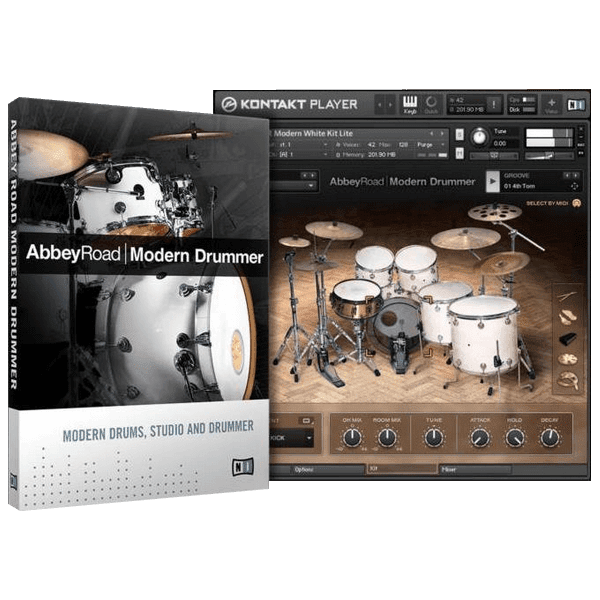 ABBEY ROAD | MODERN DRUMMER is an enhanced version of the original ABBEY ROAD | MODERN DRUMS, updated to integrate developments in KONTAKT 5. All the new ABBEY ROAD DRUMMER instruments include the advanced Mixer Section and Groove Library feature from STUDIO DRUMMER. All drums were recorded at Abbey Road Studios in London, UK, using period equipment and recording techniques. An iconic symbol of the music industry since 1931, Abbey Road has been the location of countless landmark recordings by artists such as The Beatles, U2, Kate Bush, Oasis, Kanye West and Radiohead, to name just a few. Abbey Road has pioneered many studio techniques and technologies, and is widely recognized as one of the most advanced recording, mixing and post-production complexes in the world. Two top-of-the-line drum kits deliver two very different contemporary drum sounds. 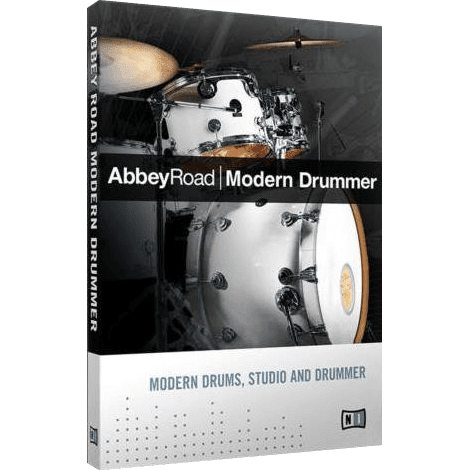 ABBEY ROAD | MODERN DRUMMER provides a choice of three snares per kit and a number of ‘character’ cymbals, including the Sabian Chopper and Zildjian Spiral Trash. Recorded in Studio 3, the Sparkle Kit is a contemporary Pearl Reference kit with a tight, disciplined sound for modern pop, ballads and all-purpose use. The White Kit is a Drum Workshop Collector’s Series kit from the mid-90s. A maple kit, tuned low for drive and edge, and recorded in Studio 2. The right drum sound is only part of the equation. All the updated ABBEY ROAD DRUMMER instruments provide a new Groove Library, full of beats and fills to match the sound of the drums. These MIDI patterns were played live by professional drummers – find the beat that suits the track you’re working on, choose fills and variations to match, then drag and drop into your host sequencer. And if you’re a drummer yourself, just hook up your e-drums and you’re ready to go.